A couple of months ago I purchased a new Daniel Smith paint, a lovely green Serpentine. I already have a few (ok ok, quite a few) but this one is sourced from Australia and I thought it would come in handy with my on location paintings. Several weeks ago, I went to make a quick run to the shops. When I pulled into the local grocery store parking lot my eyes immediately went to a gorgeous tree with bark peeling & stripping away. Underneath the old bark was a lovely serpentine yellow green and the upper half had muted browns and blues. So rather than going in and doing my shopping straight away, I retrieved my camera to shoot several photos of the tree while the light was just right. It took half an hour walking back and forth, around the tree. I pottered about doing some close ups and touching the tree, thinking of what colours I might use to paint it. I’ve wanted to ‘do something’ with this image but nothing had really grabbed me. Until today. 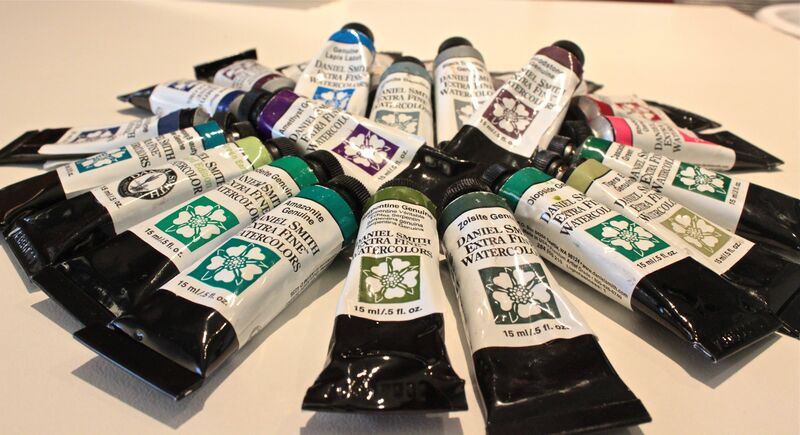 Today I got out my Daniel Smith paints with the idea of exploring a few new colour combinations. One of my favourite things to do is to simply ask “What If…?” and then take a risk and try it out. After a few warm ups, I got down to some serious play. I usually seem to produce better quality images when I’m free, loose, experimenting – rather than on a time line, with a tight rigid idea of what I have to produce. I chose Daniel Smith Serpentine first, as it a natural pigment actually sourced from Australia. Next came Hematite Violet, Sleeping Beauty Turquoise and Sodalite. I’ve not used these 4 in combination previously, so it would be a surprise. 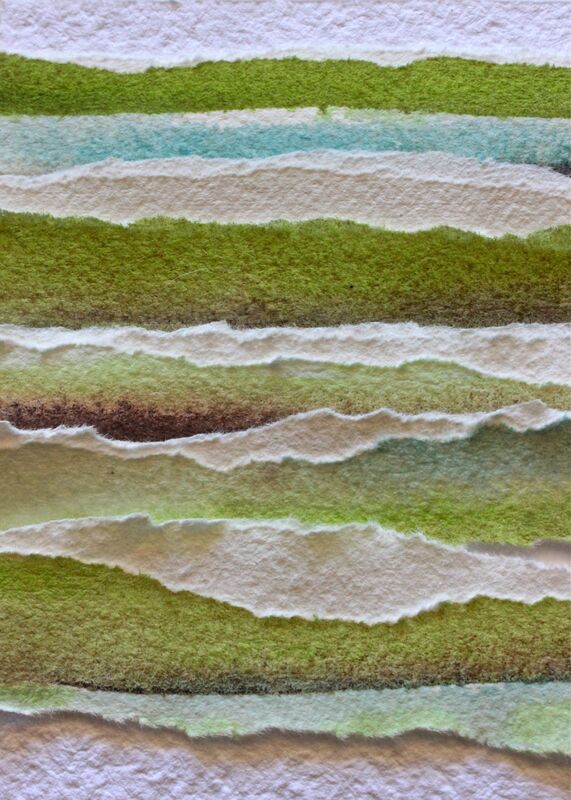 I painted on Arches rough watercolour paper, painting each colour in strips. Returning to the image of serpentine, hematite, sodalite, sleeping beauty turquoise layerings – I wasn’t enjoying the image quite yet. Tearing the edges near strips’ centres in a vertical tear, created lovely torn, bright white deckled edges for contrast. Using a Shizen handmade 100% cotton paper as a backing, I next attached the vertical strips in an arrangement that works for me. The vertical strips being loosely attached create the feeling of bark that is just starting to strip and peel off. I quite like the bush feel and sensitivity of the piece. Creating a hint of mystery and intrigue that would be missing – if it was all spelled out and ‘just like the photograph.’ Thats why I don’t generally “dot all my I s nor cross all my T s” when I’m working a painting. Its different than what my mind originally thought it was setting out to do – but I think with experience I’ve learned to go with what the image wants to be rather than obstinately trying to force my will upon it with disastrous and disheartening results. Get your paints out, take a risk and experiment. Its only …paper. I hope you enjoyed your visit and Thank you for stopping by! Thanks Leslie! Its lovely to play with the different media and make new discoveries.Art is great!